4Life Riovida, Transfer Factor Juice Now with Tri-Factor Formula! Now You Can Taste Life! Additional Product Information BUY NOW! 4Life® Transfer Factor® RioVida™ - Liquid dietary supplement featuring 4Life Transfer Factor E-XF, acai, Lactoferrin and a 100% juice blend. RioVida is the revolutionary combination of Transfer Factor and the world’s most powerful antioxidants – in a great tasting drink! Just one ounce a day provides powerful immune support, anti-aging benefits and increased energy. Patented, Proprietary and Proven. Improve your health today! Global launch, 16th May, 2005. 4Life Transfer Factor E-XF has been proven to increase cellular immune response by 283%. Acai berries, the Brazilian wonder, are both particularly high in antioxidants and help restore natural energy levels without the aid of caffeine. Instant energy, increased vitality, ancient tonic for sexual disorders, anti-aging properties, anti-Cancer, improves cardio vascular system, lowers LDL (bad cholesterol), protects the prostate, anti-bacterial, helps allergies, improves digestion, helps with stress, improves fat metabolism, feeling of awareness, improved mental focus, anti-oxidant, better sleep, and sustained energy and strength. Pomegranates blow green tea and red wine out of the water when it comes to antioxidant levels. Tones digestive organs, nausea, lowers blood pressure, increased resistance to infections, aid with diarrhea and dysentery, anti-intestinal parasites, helps prevent kidney and bladder stones, helps teeth and gum disorders. Blueberries are not only high in antioxidants, they also support digestive health and work to reduce excessive inflammation. Improved eyesight (especially night vision), anti-aging, anti-fungal/bacterial/viral, reduces LDL, improves memory, reduced heart disease, improved motor skills. Elderberries go to work instantly to neutralize free radicals, support your cardiovascular health, and manage those stress levels. Anti-infection, antiviral, anti-oxidant, and improved night vision. Purple grapes, an active antioxidant, purple grapes also support circulatory and cardiovascular health. Lactoferrin, although it has a funny name, is serious about immune health. It supplies vital milk proteins that provides the immune system with some of the building materials it needs to stay strong. A good Iron source, antiviral, antibacterial, stimulates the immune system, promotes friendly intestinal flora, antioxidant, regulates iron metabolism and reduces cell degeneration (aging). 1. What is 4Life Transfer Factor RioVida? 2. How is 4Life Transfer Factor RioVida Unique? 3. What are Transfer Factors? 4. How do Transfer Factors Works? 5. Are Transfer Factors Validated? 6. How do the Ingredients in 4Life Transfer Factor RioVida Support Total Body Health? 7. Does 4Life Transfer Factor RioVida provide for my daily Immune Support Needs? 8. Can People with Allergies Or Lactose Intolerance use 4Life Transfer Factor RioVida? 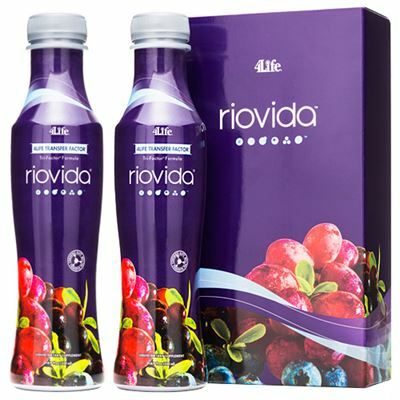 4Life Transfer Factor RioVida blends the potency of 4Life Transfer Factor Advanced formula with 100% pure juices, including nature's energy phenomenon, the Brazilian açaí berry. Combining the immune-supporting strength of Transfer Factor E-XF with the antioxidant power of açaí, pomegranates, blueberries, elderberries and grapes, RioVida delivers a rush of vitality. 4Life Transfer Factor RioVida is the first liquid dietary supplement to combine the immune support abilities of transfer factors with a proprietary antioxidant blend for refreshing daily nutritional support. This power-packed juice is perfect for people on the go and makes it easier than ever to receive your daily supply of immune-supporting 4Life Transfer Factor, along with a potent source of free-radical balancing antioxidants. Transfer factors educate the immune system about a present or potential danger and equip it with a plan for action. Although the most notable function of these smart molecules is to support the recognition of a threat, they also help remember past invasions, allowing the body to respond quickly to similar health threats. In addition, transfer factors boost or balance your immune response, depending on what your system needs. RioVida includes Transfer Factor E-XF, which combines the strength of transfer factors extracted from cow colostrum and chicken eggs. This blend was developed exclusively by 4Life using patented and patent-pending technology. Our immune system provides us with important protection from the threats we face in our environment, just as the computer seeks protection from internet viruses with anti-virus software. But in an ever-changing world, even the best software won't always be up to the challenge. Just as you can upgrade your anti-virus software to secure your computer from internet viruses, transfer factors provide the upgrades your immune system needs. Transfer factors tailor their teaching to the type of education your immune system needs - increasing function and vigilance, or restoring balance. Transfer factors were discovered in 1949 by the pioneering scientist, Dr. H. Sherwood Lawrence. Since that time, world-leading scientists and physician have established the safety and outstanding immune system support of transfer factors with valuable medical research and hundreds of scientific papers documenting their benefits. With the recent achievement of transfer factor extraction processes from cows and chickens, transfer factor science has entered into an exciting new era. There have been over 3,000 scientific studies published on Transfer Factor. In addition to the immune punch of Transfer Factor E-XF, RioVida contains a variety of ingredients to balance free radicals within the body and support cardiovascular, digestive, urinary and immune health. FOUND DEEP IN THE LUSH JUNGLES OF THE AMAZON, the açaí berry provides a potent source of antioxidants and also boasts a balanced complex of essential fatty acids, amino acids and valuable trace minerals. The nutritious açaí has been prized by the locals for its ability to support the immune response, energize the body, and balance free radicals. In addition to açaí, RioVida contains numerous health-supporting ingredients, Blueberries nutritionally support digestive health, the brain and neurological system, Elderberries, also potent antioxidants, work with the immune system. Pomegranates are a great source antioxidants, fiber and vitamin C. RioVida contains vitamin C and lactoferrin (a beneficial milk protein) for their fortifying antioxidant properties and nutritional immune system support. One ounce of RioVida provides a full day's serving of Transfer Factor E-XF, as well as the immune support of lactoferrin, açaí, blueberries, pomegranates and elderberries. For additional immune support, 4Life Transfer Factor and 4Life Transfer Factor Plus Advanced Formulas are proven to nutritionally support your immune system. Yes. Transfer factors themselves are non-allergenic. 4Life's extraction process removes common allergens in egg and colostrum sources. Any remaining lactose in colostrum-derived transfer factors is far below the amounts that typically cause reactions. (As a precaution, people with allergies specifically to egg yolks should check with their physician prior to taking RioVida). The Information in this site is provided for educational purposes only. It is not intended to rely upon for diagnosis or treatment of any disease or medical condition. Seek advice from your health care professional regarding the applicability of any information, opinion or recommendation for diagnosis or treatment of any symptoms or medical condition. Statement and testimonies about products and health conditions have not been evaluated by the Food & Drug Administration. They are not intended to rely upon for diagnosis or treatment of any disease or medical condition. The testimonies and information on this website only represent the opinions of the individuals involved. The accuracy of each testimony has not been verified. We encourage you to use common sense in your expectations in consuming any nutritional product. Keep in mind that some of these statements and testimonies come from distributors of these products and may have a conflict of interest. It is not suggested that anyone should replace traditional medical treatment with Products of 4Life Research. They are not intended to treat, cure, or prevent any disease. Copyright© 2005-2011 Expert PC. All rights reserved.